Granted, I'm talking about a very small sample group in this instance--four people working at two different grocery stores--but how can it be that so many folks don't know anything about making jams and jellies at home anymore? I guess that I should take this realization for what it is and just be grateful that my mom and grandmas not only made fruit preserves from scratch but also let me, nay, encouraged me to help! The truth is, they're not that difficult to make and it can be a very satisfying and rewarding process. My first attempt at making jam this June did not inspire confidence. 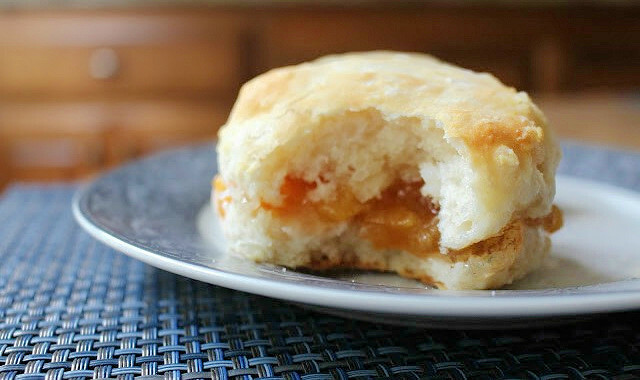 Happily, this second go-round was peachy keen, and it's currently being enjoyed on everything from plain ol' buttered biscuits to open-faced mozzarella, peach jam, and fresh basil sandwiches. I added cinnamon to this batch because, well, I add cinnamon to just about everything. In this case, it was not a daring choice by any means, but rather a sensible, obvious, and very delicious one. I have a feeling I'm going to get a little jam-crazy this summer, so be prepared. Sterilize half-pint glass jars and lids with boiling water. Dry thoroughly. Measure exactly 4 cups prepared fruit in 4-cup glass measure. Pour fruit into a saucepan. Cook, uncovered, over medium heat just to the boil (bubbling in the middle as well as around the edges). Remove from heat and stir in lemon juice and cinnamon. In a clean saucepan, stir together sugar and pectin, then stir in water. Bring to boil over medium-high heat, stirring constantly. Boil and stir 1 minute; remove from heat. Immediately add peach mixture; stir 1 minute or until well blended. Fill all jars immediately, leaving 1/2 inch space at top for expansion. Wipe any drips off top edges of jars; immediately cover with lids. Let stand at room temperature 24 hours. Jam is now ready to use. Store in refrigerator up to 3 weeks or freeze extra containers up to 1 year. Thaw in refrigerator before using. I love freezer jam! My grandmother always made raspberry freezer jam and it was absolutely delicious in the nooks and crannies of an English muffin! 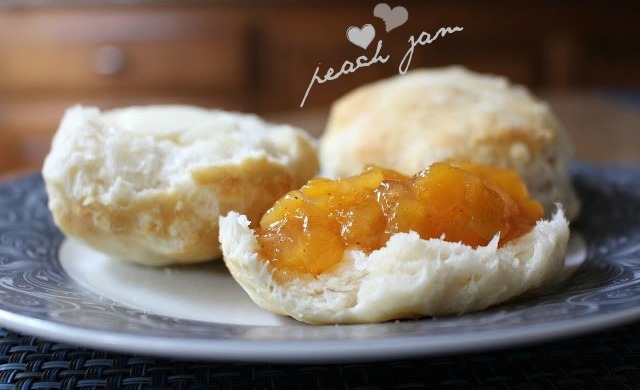 Your peach jam looks perfect! The jam turned out great, Grace. I love the add of cinnamon. A wonderful jam! Great texture and flavour. Mmm, totally LOVE homemade jams and have been doing it for many years. I usually make "regular" peach jam and "spiced" ( cinnamon and just a dash of nutmeg) peach jam. Also, strawberry, rhubarb strawberry, and apple jelly. Can't wait to do it again. Thanks for the reminder. My mother made freezer jams all the time, so I'm totally familiar with them. I made them for my kids, too. But stuck mainly with raspberry, blueberry and strawberry. Love the idea of making peach with the cinnamon...does not surprise me, as I bet you add cinnamon to just about everything! Be fun to try some herbs too. Mouth watering photo! I think the only reason I knew about pectin is because my mom would make jam a lot. It's funny, when I worked as a cashier, I was one of the only ones who worked there that knew where to find it. I seriously need to try making homemade jam! Guess what I'll be making this week? YUM!!! Freezer jam is the best. This sounds so good! You are definitely lucky that you grew up in an environment where you got to learn about the great world of preparing food! I didn't realize how lucky I was back in the day, I only wish maybe I had paid more attention to my grandmothers! I've wanted to make this for ages but we can't get that pectin in Australia. I wonder if it will work with any other kind of powdered pectin? I KNOW about pectin, but I can't say that I've ever actually used it...perhaps it's time I changed that? This jam sounds lovely! What an amazing freezer jam! I love it! Thanks for sharing! I love homemade jams and marmalade. Your jam looks delicious. I never made peach jam before. Maybe it is time to try it. I, too, am a fan of freezer jam. I make Meyer lemon marmalade every winter that I store in the freezer. Gives me a taste of sunshine all year round.